Eli Manning's streak is over: What now? NEW YORK (WABC) -- Emotions are riding high, so let's take a step back and take a look at what the New York Giants have done. Technically, Eli Manning was not benched. 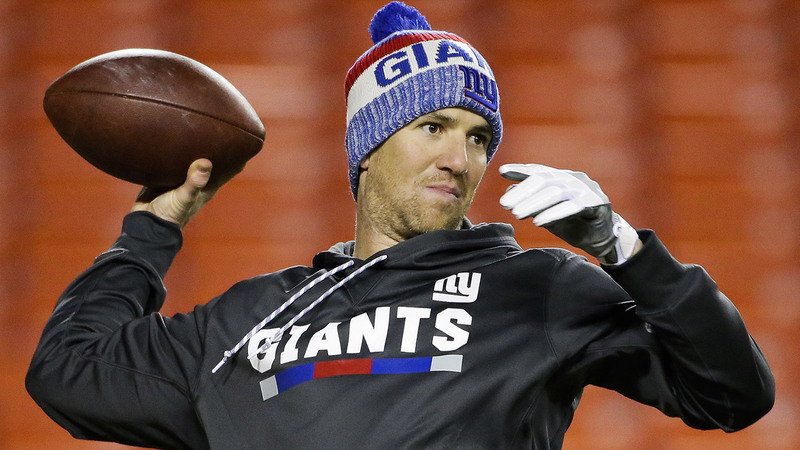 The Giants offered their quarterback a chance to remain the starter and play the first half. Eli decided he'd rather not tarnish his 210-game consecutive start and will let Geno Smith start Sunday in Oakland. This is where the Giants made a mistake! Geno Smith? Seriously folks, does he have a future as the Giants starter? No way. This is where Giants fans have a reason to be angry. Big Blue must get a look at rookie Davis Webb and see if he can be a starter in the NFL. The Giants will draft in the top 5, possibly in the top 3, they need to know if they have to draft another quarterback. The smart move is for the Giants to look at Davis Webb over the final 5 weeks and make that decision. Eli Manning is total class, no question about it. He has been a great Giant, led them to two Super Bowls, but his best days are behind him. Eli's career with the Giants is not over -- he could still be the starter next season -- but it is time to start the dialogue about who will eventually replace him. The Giants and the fans need to take the emotion out of it, and figure out what is best for this team going forward.